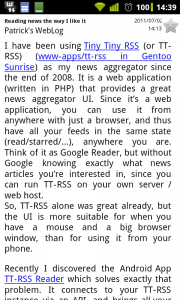 I have blogged about TT-RSS just recently. And when Andrew Dolgov, TT-RSS’s initiator and main contributor released version 1.5.5, I thought I’d try to improve the ebuild a bit, given that it is in Portage now. 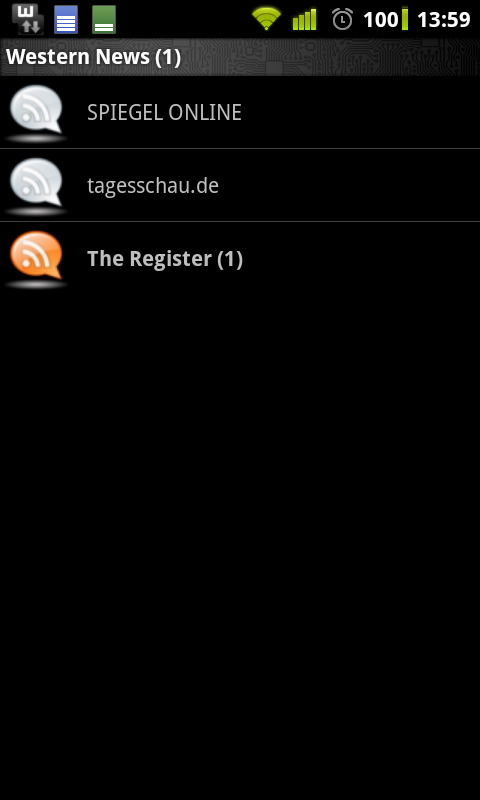 So I added a ‘daemon’ USE flag, which makes it easy for Gentoo users to get TT-RSS to update the RSS feeds. When you emerge www-apps/tt-rss with USE=daemon, it will now install an init script to start the ‘ttrssd’ daemon (or multiple, if you have multiple TT-RSS instances on your host). This is the preferred way to keep the feeds updated, according to TT-RSS’s documentation. So, if you need a great, centralised (i.e. synchronised state amongst your computers, phones, etc.) 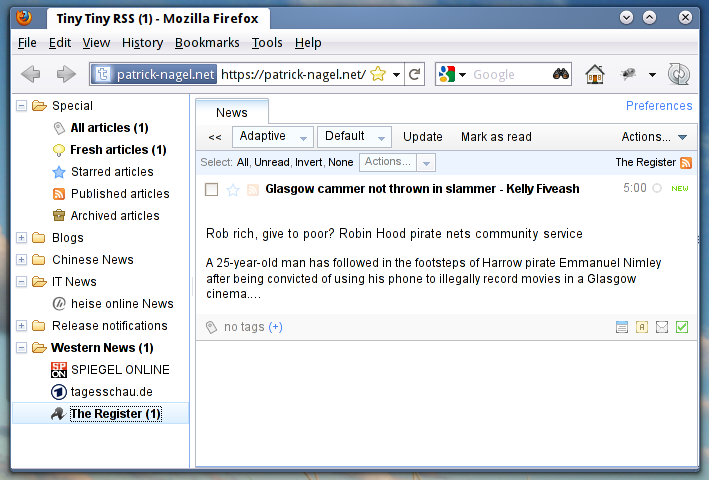 news aggregator that runs on your own server / web host, give tt-rss a try! And if you’re a Gentoo user, I’d appreciate if you could test the new ebuild’s features (USE=daemon), and give feedback here or open a bug report if there is anything that could be improved further. 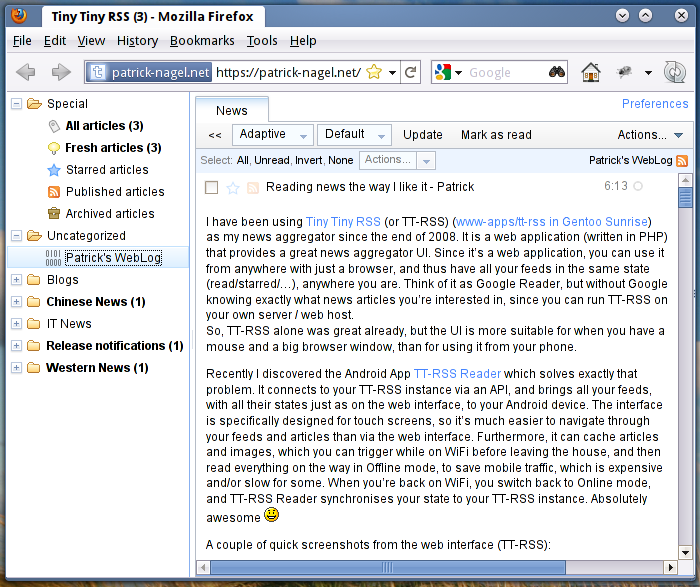 I have been using Tiny Tiny RSS (or TT-RSS) (www-apps/tt-rss in Gentoo) as my news aggregator since the end of 2008. It is a web application (written in PHP) that provides a great news aggregator UI. Since it’s a web application, you can use it from anywhere with just a browser, and thus have all your feeds in the same state (read/starred/…), anywhere you are. 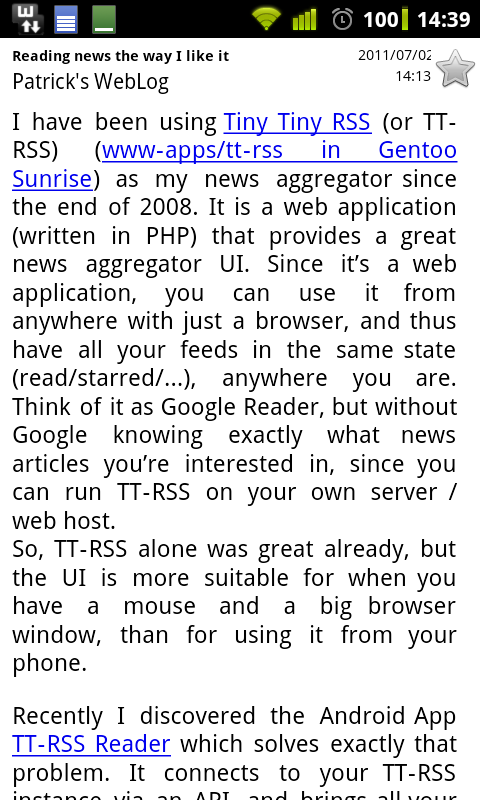 Think of it as Google Reader, but without Google knowing exactly what news articles you’re interested in, since you can run TT-RSS on your own server / web host. So, TT-RSS alone was great already, but the UI is more suitable for when you have a mouse and a big browser window, than for using it from your phone. 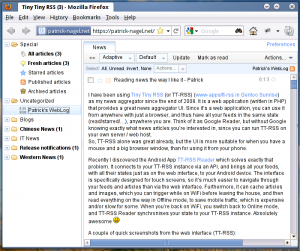 Update (2011-07-03): Shortly after posting this, hwoarang offered to take TT-RSS from the Sunrise Overlay into Gentoo’s main repository (Portage), with me proxy-maintaining it. So now it’s even easier to get TT-RSS onto your Gentoo-powered server. I really like the command line mailer Heirloom mailx (formerly nail), and now there is even a current version in portage again (still under the name mail-client/nail, but that doesn’t matter), so that’s even better. I use it on all servers, since it’s just convenient – it can handle attached files, UTF-8 etc. without any problems. But there was one problem that bothered me for months already: It involved my check_updates.sh script, which basically just calls /usr/bin/emerge -upvDN --nospinner world for the host and all virtual servers, and then sends the output to me. The problem: emerge’s output always ended up as ‘attachment.bin’, attached to the (otherwise empty) mail, although I piped it into mail -s "Updates for $DATE" root where it should come out as the mail body. I knew that Heirloom mailx does that, as soon as it doesn’t “like” one of the characters in the input, but I couldn’t think of a reason why it would do that with emerge’s supposedly plain-ASCII output. It outputs the unique decimal values of any byte occurring in ‘attachment.bin’ as a sorted list. I expected to find something above 127 – but the highest occurring value was 122 (“z”). I then checked the top part of the list, and to my surprise, found 008 (backspace) there. After removing those by piping the output through tr -d '\010' (8dec = 10oct, and tr needs octal values), Heirloom mailx no longer put the text into ‘attachment.bin’. It now appears in the mail’s body, where it belongs. … so removing them is not a big loss. I’d like to know though, why they are there in the first place, even though the output doesn’t go to a TTY.